Search for your new home in A Country Place, an active adult community in Lakewood NJ. A Country Place in Lakewood is an Active Adult Community for people age 55 and older. There is a monthly association fee, which covers exterior maintenance of the attached homes. In addition they take care of lawn maintenance and snow removal. Also – trash removal and use of the common areas, including the clubhouse and pool. A Country Place is ideally located because houses of worship are within walking distance. Shopping is nearby, as well as numerous places to dine. In fact, The Jersey Shore is nearby. And, you’ll find live entertainment in Lakewood at The Strand Theater. The homes have either 1,2 or 3 bedrooms. Also, the homes have one or two baths, and some homes have a garage. Built in the 1970’s, most of the homes are attached. However, there are also a few detached homes. The social center of the community is the clubhouse, In addition to the multi-purpose room there’s also a cozy library. When the weather is warm, you’ll find tennis courts, and an outdoor pool. The clubhouse also contains a fitness center if you desire to exercise and stay in shape. A Country Place also provides a community bus. 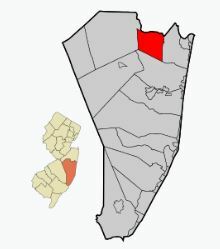 While A Country Place doesn’t have a golf course, the are many golf courses in Ocean County. The Department of Transportation Services county transit system provides bus transportation within Ocean County. Two major services are provided. Available are local bus routes to shopping, other adult communities and more. Furthermore, Reserve-A-Ride provides door-to-door, non-emergency medical transportation service. This service is for seniors (age 60 and over) and persons with disabilities. Transportation to and from medical facilities in Ocean County is provided. Advance reservations are required, however there is a small charge for this service. Additionally, bus service to New York and north along Route 9 is available.